To Heaven and Back Again: American Eclipse Part 2 - America's Doom? An eclipse crossed America from sea to sea without touching another country on August 21st, 2017. There are many people proclaiming that this American Eclipse was a sign that God’s judgment will soon come. Is it the doom they are declaring, the end of our country, or something else? The answer to this single questions is complex. In 1918 an eclipse went from coast to coast and also passed over the Bahamas then America emerged victorious from World War One. The last time an eclipse crossed the entire country and didn’t cross another country was in 1776, the year America became a nation. The American Eclipse was 67 miles wide. In 1967 the “Jesus people” or Jesus movement began. This gave birth to Calvary Chapel and Vineyard Churches. The eclipse happened on August 21. Psalms 82:1 says, “GOD STANDS in the assembly [of the representatives] of God; in the midst of the magistrates or judges He gives judgment [as] among the gods.” (AMPC) The new level of spiritual authority will come to the Body of Christ as knowledge spreads about the Courts of Heaven. This is the long hidden, missing key to our authority. All of these things are positive, not doom and gloom. This eclipse is definitely an important sign, but what does it mean? America’s southern coast has been hammered by record-breaking weather this summer. Fires swept across the northwest. I asked the Lord what these things meant. The Holy Spirit brought things connected to the hurricanes to my attention in a way that has become a pattern in my life. God brought Kristy Friesen into my life in 2016. He immediately showed that He was in the middle of this relationship; often we were reading or watching the same information about Him at the same time. She will often point things out and God will speak to me about those things. On September 9th Kristy asked me about some comments on a post about the hurricanes that were hitting America’s southern coast. The two comments she mentioned worked together to answer the question: What can America expect? 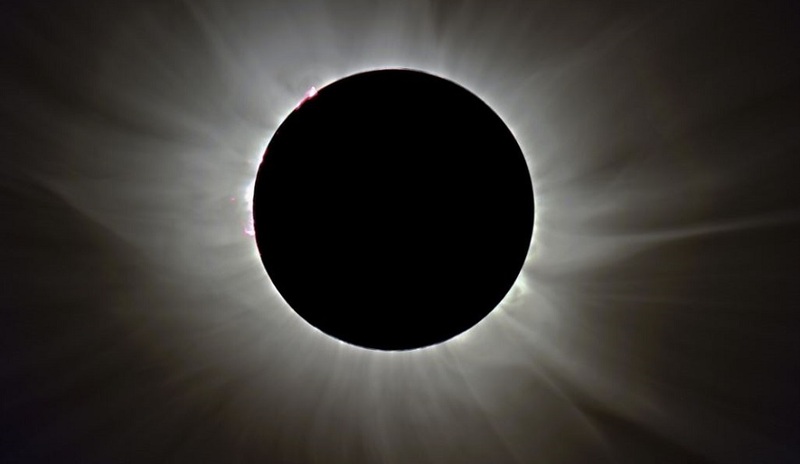 Yes, God sent an eclipse before Nineveh was destroyed. God also sent a prophet, Jonah, to warn them of the impending doom so that they would have a chance to change their ways before judgment came. If the American Solar Eclipse is a sign of impending doom and judgement, we should be looking for a prophet to appear. What kind of prophet? The second commentator held that answer. As the commentator explained what the number eleven meant according to dream interpretation, Holy Spirit said, “She got this wrong.” There are well meaning people who really do hear from God then go in a completely wrong direction. They prophesy the obvious doom of the impending storm instead of what God is really saying. “Okay, but I’m not skipping ahead,” I replied. I have asked God ever since, “John the Baptist was prophesied about in the OT, where is the prophet to the second coming in the Bible?” The moment I read these two verses, a strong knowing formed in my spirit: God had finally revealed the answer. Meaning: I had no idea what this verse was referring to, so I read the passages before it so I would know what was transpiring. Jesus had made His triumphal entry into Jerusalem on Good Friday where people had lined the streets laying palm branches and their cloaks before Him, shouting, “Hosanna.” This was a greeting for a king. Jesus then went straight to the temple. This was Jesus’ first coming which Israel did not fully recognize. Jesus usually went to the temple to teach. He knew what time it was and how late it was before He went to the temple. So why did He go? Jesus wasn’t at the temple as a teacher. He had come into the city as the King. When He arrived at the temple He “looked around” and no one was there to greet Him as King, so He left. John the Baptist was called the witness of the coming of Jesus. It was His job to announce the arrival of the King which is what happened in this verse: Jesus arrived as King. This verse shows the job of the Witness of the Coming of Jesus; to announce His arrival. This verified that it is the job of the Witness of the Second Coming we are discussing. Meaning: Once again I needed to read a few verses before this one: They speak of asking of God and seeking God and because of this you will receive from God. This, too, is in the job description of the Witness of the Coming of Jesus. The baptism that John performed was a declaration by people that they were going to turn from the sin that had drawn them away from God and go back to God as they prepared for the arrival of Jesus. This renewal of relationship with God was the best gift they could receive. Usually Israelites would have to bring sacrifices (which cost money) to obtain forgiveness. However, John was preaching that it was a matter of the heart: come and change your ways and be baptized so that you are ready for the appearance of Jesus. It was from these baptisms that John earned the name, John the Baptist. The Witness to the Second Coming will also be bringing a message of the free gift, a good gift from God. Meaning: The leaders of the body of Christ are looking for the Awakening because the church is asleep. John the Baptist certainly woke up the nation of Israel. Look for the anointing of the Lord upon His Witness that will awaken His church. These first Four verses show the ministry, the job description, of the Witness of The Second Coming of Jesus. Since we have John the Baptist’s ministry to compare it to, it is easy to see. Meaning: The two verses before this give the meaning of a vision Peter had. Gentiles are no longer unclean. These three men arrive to take Peter to the home of the first Gentile who will receive the Baptism of the Holy Spirit. Could this mean that the Witness to the Second Coming is a Gentile? Meaning: This is speaking of the fact that Israel rejected Jesus so that salvation could come to the Gentiles. What God brings to and through the Gentiles will provoke the Jews to jealousy. The Bible tells us that through two witnesses a thing is proven. This is why we always look for two verses in the Bible to support our position on something. God gave us this second verse to verify that the next Witness of the Coming of Jesus will be a Gentile and it will provoke Israel to jealousy. Meaning: This comes at the end of what is perhaps the most misunderstood portion of the entire Bible. As much as I love the Amplified Version of the Bible, 1 Corinthians is understood better in every other version except the Amplified. At the time this was written, Rabbis, such as Paul, would receive letters with questions about God and His ways. The Rabbi would then write a “Responsa,” a letter answering that question. These letters would often repeat the question, lest the reader forget what he was asking, then the answer would be stated. The entire book of 1 Corinthians is a “responsa” written from Paul to the Corinthians. If you look carefully you will see a pattern of a statement then an answer given. By chapter 14 the questions are so outrageous that Paul writes, “What! did the word of God originate with you… is there a prophet with a new word?” This shows that these things he has just stated are far outside Jewish teachings. The Prophet to the Second Coming will be a woman. There is a foreshadow of this in the NT. When Jesus’ parents brings Him to the temple as a baby there are two people waiting to acknowledge Him as the Son of God. The first is a man name Simeon who prophesied over Him, the second is also a prophet, a woman named Anna. The first Witness of the Coming of Jesus was a man, the second will be a women. Meaning: God is taking a minute to remind us that He is sending His witness because of His love for us. Meaning: Here is the second verse about a woman and one who “received physical power.” Just as Sarah, Abraham’s wife, became the mother of the Israeli nation, so will there be a female prophet to the Second Coming of Jesus. More than one of the prophetic voices (men) of today has stated that men are not getting the job done, that God is raising up women for this next move of God. I’m not sure they know how right they are! Meaning: Look at the perfect flow of all the 11:11 verses. First, the two positive meanings of 11 are “Bible heroes” and “great faith.” Both apply to John the Baptist. The first 11:11 in the NT begins with declaring who is being talked about, the Witness of Jesus. The job description is given first, then the description of the individual who will fulfill it. The very last verse is the death of the witness; both of them actually. God used 10 verses to reveal this truth. The biblical meaning of the number 10 is ordination which means to confer holy orders on someone. Only God could orchestrate such a thing where every piece has a perfect meaning! Well, since they are both called “The witness” of the Coming of Jesus and it now appears the there will be two of them, it does seem to be the case. Most people read the passages about the two witnesses being the “two olive trees” which stand before God and assume they both must be from Israel since the country is often referred to the olive tree. However, the Gentiles are called “the wild olive tree grafted in.” Once a tree is grafted in, they are one and the same. Gentiles are also olive trees. Consider this: Many think Enoch will be one of the two witnesses because he never died but was taken directly up into Heaven. Enoch lived before Abraham, before there was a Jewish nation. Enoch was a Gentile. John the Baptist wasn’t Elijah reincarnated. In the book of Luke it says, “he will go before Him in the spirit and power of Elijah” speaking of John the Baptist. This means the same heart and gifting that Elijah had, John also had. Therefore the two witnesses are not two mysterious people coming from Heaven, but people born here on Earth with the heart and gifting for the job at hand. In the unedited account of my journey with God, To Heaven and Back Again (a free book) I record how God has said that there is a world-wide financial collapse coming. Because it is a ways off and there are other things that are going to happen first, I didn't feel the need to stir up a panic over this coming disaster. First there must be an outpouring of Glory. Until you see ALL being healed in the name of Jesus, this calamity is not going to happen. Right now we are in a period of Awakening. God is drawing people to Him. Do you feel a tugging on your heart, a hunger for more of Him? This is what the Awakening is about. Agabus was a prophet. He warned the disciples about the coming famine. God poured out His glory, then a world catastrophe came. If God is taking His people back to the power He displayed at Pentecost, then there will be backlash in the natural. A worldwide great depression will follow. Even when it does come to pass, it is nothing to worry about if you have a relationship with Jesus. Do NOT give fear a place in your life. If you draw close to Him during this Awakening and learn to operate in His ways as He is pouring out His glory, you will be okay. Christians will be doing as Jesus did: one meal will feed 5000. The ability of America, or any nation for that matter, to recover from this coming depression depends on what they do when God’s glory comes. Angels will be sent to quickly restore and aid nations who turn away from sin and back to God. Those nations where the majority of people gather for the miracles, signs and wonders yet still continue to sin will take longer to recover and be hit harder. This does not mean that we should point our finger at people and say: “stop sinning!” Jesus tells us to take care of the plank (our sin) in our own eye before we try to help our brother. Our job is to love God and love each other. The Holy Spirit and the Word of God are responsible for convicting people of their sin.